After a disastrous Middle East mission ends his six-year Army Ranger career, Finn McGregor needs some downtime. A peaceful month in the woods sounds like the perfect way to decompress. But peace isn’t on the agenda once he crosses paths with publishing executive Dana Lewis, a neighbor who is nursing wounds of her own. Someone seems bent on disrupting her stay in the lakeside cabin she inherited from her grandfather. As Finn and Dana work together to discover who is behind the disquieting pranks, the incidents begin to take on a menacing tone. 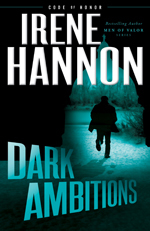 And when it becomes apparent Dana’s foe may have deadly intent, Finn finds himself back in the thick of the action—ready or not. 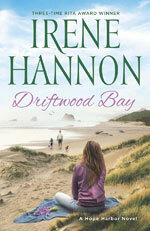 “(Hannon) shows off her amazing gift for characterization and blending of romance and mystery. Finn is a great hero who will make even the most jaded reader believe in a happily ever after. 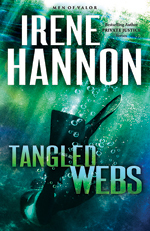 Breathtaking suspense is balanced out by lighter moments in this wonderful tale." It was a terrible night to die. Father Daniel Pruitt cringed as another boom of thunder shook the ground beneath his older-model Taurus. This weather wasn’t fit for man nor beast. Priests, however—different story. Being available 24/7, no matter the whims of Mother Nature, was part of the job description. That’s why the archdiocese paid him the big bucks. Setting his brake, he peered through the pelting rain toward the hospital. In better days, Joe Larson would have offered one of his quiet smiles at that wry joke. He knew, as did all the parishioners at St. Michael’s, that priesthood was a vocation, not a job, for their pastor. That Father Pruitt considered it a sacred privilege to be there for his flock during life’s biggest transitions. And death was a huge transition. Especially when the person dying was alone—except for God. Father Pruitt gauged the distance from the car to the front door of Faith Regional and sized up the black umbrella on the seat beside him. The folding model was better suited to fending off April showers than April monsoons. No way around it—he was going to be uncomfortably damp for hours. With a resigned sigh, he tucked his book of prayers inside the inner pocket of his raincoat. Positioned the umbrella. Opened the door. His pants legs were soaked before his feet hit the ground. Ducking his head—and keeping a firm grip on the umbrella as the blustery wind tried to wrench it from his grasp—he jogged toward the entrance as fast as his sixty-five-year-old arthritic knees allowed. The door whooshed open as he approached, and he scurried inside, moving from darkness to the perennial day of the rarefied hospital world. At this late hour, the reception desk was deserted, all the volunteers long gone and in bed—the very place he’d been until the urgent call came in sixty minutes ago. And based on what the nurse had said, there would be no more sleep for him this night. He continued to the bank of elevators. One opened the instant he pressed the up button, and ten seconds later the doors parted on Joe’s floor. A woman at the nurses’ station looked up as he approached. Holly, according to the ID pinned to her scrub top. The nurse who’d summoned him. “Yes.” He halted across the counter from her, his sodden umbrella shedding drops of water on the floor. True. Motoring through the Nebraska cornfields from Linden to Norfolk was pleasant enough on a sunny day, but the trek across dark countryside while battling wind and rain had seemed endless. She was already talking on her cell, heading the opposite direction from Joe’s room. Trying to ignore the wet fabric clinging to his legs, Father Pruitt made his way down the corridor. Most of the rooms he passed were dark; Joe’s was dimly lit. Hand on the knob, he paused for a moment of prayer, then entered and closed the door behind him. As he approached the bed, his rubber-soled shoes silent on the floor, Joe didn’t stir. Hard to believe this gaunt figure was the same man he’d visited here three days ago, when they’d both assumed his lung infection would follow previous patterns and clear up. But it didn’t take a medical professional to know there would be no reprieve this time. Above the nasal cannula delivering oxygen to lungs that had finally succumbed to the man’s sole vice—chain smoking—Joe’s cheeks were sunken and shriveled. His disease had followed the classic pattern: shortness of breath, fatigue, weight loss, infections, heart failure . . . and now his uneven respiration completed the pattern, affirming the truth of the nurse’s comment. The end was, indeed, near. Father Pruitt hung his coat over a chair and moved beside the bed. Perhaps his faithful parishioner hadn’t been able to hang on to consciousness after all. Vision misting, he touched the dying man’s hand. During the dozen years he’d tended parishes in three small towns that dotted the cornfield-quilted land, he’d never met a kinder, more humble person. Joe might not have much in a material sense to show for a lifetime of labor in the corn processing facility, but he’d always given generously to his church and to those in need. And along the way, he’d also become a trusted friend. Saying good-bye wouldn’t be easy. All of a sudden, Joe’s eyelids flickered open. “Father.” The greeting was no more than a wisp of air. “I . . . need you . . . to do . . . a favor . . . for me.” Each gasping word was a struggle, pain contorting the man’s features. “After I’m . . . gone . . . letter in my . . . nightstand . . . at home . . . will you . . . mail it?” He tightened his grip, his gaze intent. An odd request, though. Joe had lived alone in his tiny, two-bedroom bungalow for decades—and despite their friendship, he’d never mentioned relatives or talked about anyone with whom he might have corresponded. What possible transgression could he have committed while flat on his back in a hospital bed? The room fell silent save for the other man’s labored breathing, and at last he lifted his chin. Joe was watching him, eyes filmed with moisture. “This is . . . bad . . . Father.” Anguish darkened his blue irises. But as it turned out, that was a lie. Because as Joe recited his confession in a halting, thready voice . . . as the meaning of the letter the dying man had asked him to mail became clear . . . Father Pruitt wasn’t just shocked. Somehow he managed to complete the rite. But as he spoke the final prayer, as Joe drifted out of consciousness for the last time, his mind was spinning. How could you know a man for years and never suspect he carried such a devastating secret? He pondered that through the long hours of darkness as he kept vigil beside the bed—and was still pondering it as faint lines of pink streaked the horizon and Joe’s breathing slowed. Stopped. For several minutes, he remained seated . . . in case Joe’s spirit hadn’t yet departed the earthly realm. But at last, filling his own lungs with air, Father Pruitt pulled himself to his feet and rested his hand once more on Joe’s motionless fingers. Studied the kindly face, now at rest, all lines of pain erased. Bowed his head and uttered one final prayer. Maybe his brothers were right. Gripping his mug of coffee, Finn McGregor pushed through the door of the cabin, into middle-of-the-night darkness. The April air was chilly, but the brush of coolness against his clammy skin eased his jitters a tad. Funny how the notion of spending four quiet weeks in a secluded cabin had seemed inspired ten days ago but now felt so wrong. Just as Mac and Lance had predicted. He huffed out a breath. Okay . . . staying in St. Louis until he’d fully wrestled his demons into submission might have been smarter—except he had a decision to make, and trying to do that with his two overprotective big brothers in hover mode had been impossible. Melting into the shadows of the rustic porch, he took a sip of the strong brew and did a sweep of woods unbrightened by even a sliver of moon. The blackness was absolute . . . yet it didn’t raise his anxiety level one iota. Darkness had often been his friend. A significant tactical advantage in certain circumstances, in fact. Like the night his unit . . .
His hand jerked, and hot coffee sloshed over the rim of the mug, burning his fingers. Shaking off the liquid, he gritted his teeth. Good thing Mac and Lance weren’t here. He could picture them, arms folded in that intimidating pose all the McGregor men had mastered, reminding him that hanging out alone in the middle of nowhere might not be the best game plan at this stage of his recovery. He was here now, and he wasn’t going back—not yet, anyway. Not after two nights. His McGregor ego would never let him admit defeat this fast. However . . . if the quiet and solitude were still too oppressive in a few days, he might make the hour-and-a-half drive back to St. Louis. Despite its remote feel, this part of the Mark Twain National Forest wasn’t all that far from the bright lights of the big city he’d called home for the past nine months. More than likely, though, he just needed a few days to acclimate. The stack of books he’d brought with him should keep him occupied. And he might chop some wood with that ax he’d found in the shed. Nothing beat manual labor for exorcising restless energy. Finn choked on the coffee as a woman’s distant scream ripped through the night. Still sputtering, he pushed off from the wall, adrenaline surging, every muscle taut. Yards from where he stood, the underbrush rustled—a foraging rodent or raccoon, no doubt. Nothing sinister. Throttling his paranoia, he exhaled and forced his brain to shift into analytical mode. Fact one: The sound had been distant, and somewhat indistinct. Fact two: His cabin was surrounded by a national forest more populated by deer than people. As far as he could tell—based on the single narrow gravel lane off the main drag he’d passed before turning onto his own access road—he had only one relatively close human neighbor. His hand jerked again, sloshing more coffee. It was a woman’s scream. He was not being paranoid. This was not a tray dropping in the base cafeteria that just sounded like an explosion. Another scream propelled him into action. Moving on autopilot, he grabbed his compact Beretta, Ka-Bar knife, and a flashlight from the cabin, left behind the cell phone that didn’t work around here anyway, and raced through the woods, every ounce of his dormant training kicking back in. Several more terrified screams kept his direction true as he zigzagged through trees in early leaf-out stage, the winter-scoured forest floor hosting little undergrowth that would impede his progress. When he at last emerged into a clearing, breathing harder than he should be after a quarter mile run, a large, meandering lake stretched before him. A scream to his right directed his attention to a small cabin perched on a slight rise above the water, a hundred yards away. Ignoring the protests of his left leg, he sprinted toward the log structure, where light shone from behind curtains in several windows. Not helpful. The element of surprise worked best if you entered in an optimal spot. If he could determine the woman’s location . . .
As if on cue, another scream pierced the air. She was in the back of the cabin, left side. Beretta in hand, he raced toward the log structure, staying in the shadows at the edge of the woods. Too bad he didn’t have his trusty M4—but that kind of equipment wasn’t part of his standard issue anymore. Nor would it be again. He might be unclear about a lot of stuff, but that much he knew. Still, a Beretta could be as deadly as an assault rifle in a shootout, if it came to that. He hoped it didn’t. He wasn’t up for a life-and-death battle . . . physically or emotionally. But that was a moot point. Something bad was going down in this cabin, and ducking out when things got dicey wasn’t part of the McGregor DNA. Bending low, he dashed from the cover of the woods to the structure. Flattening his back against the rough-hewn logs, he eased around the corner, to the rear wall. He crouched lower and edged close to the dim light shining from the window of the room he’d pinpointed. It was open halfway—no wonder the scream had carried in the quiet country air. But the shade was pulled all the way down, and a screen stood between it and him. Might there be a window open somewhere else that would allow less obvious access? Circling back to the front of the cabin, he checked every window. He pulled his knife out of its sheath, dispensed with the screen, and worked the sash up. A slight tip of the shade revealed that the space on the other side was clear, and he slipped inside—just as another high-pitched scream ricocheted through the house. Sheathing the blade, he flexed his fingers on the Beretta and slipped noiselessly through the cabin, ticking through the factors in his favor as he psyched himself up for a confrontation that was liable to become violent. The element of surprise was on his side. He’d led dozens of successful assault and rescue missions. No matter what he found on the other side of the door where the woman was being held, he could handle the situation. Would handle it.